Its distinctive, charismatic parallel-twin engine and class-leading chassis can turn every journey the trip of a lifetime. 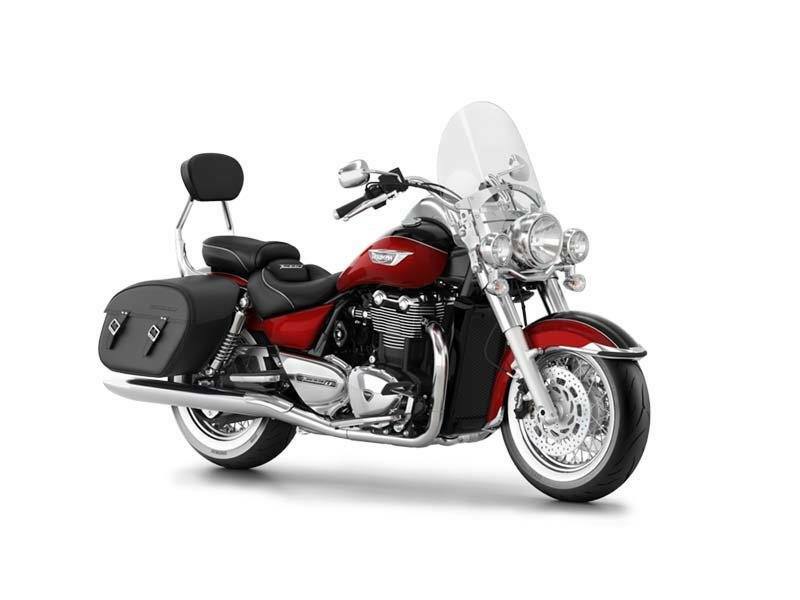 The Thunderbird LT will transport you with effortless power and style to new adventures with the easy-going, laid-back vibe of a premium classic touring cruiser. Riding Position: No matter what you’ve ridden before, you’ll feel instantly at ease with the LT, able to relax and enjoy the ride for many thousands of miles to come. Suspension: Shrouded 47 mm Showa forks and twin 5-way preload adjustable Showa rear shocks provide excellent feedback with supple control to ensure a quality ride over the harshest surfaces. Brakes: ABS-enabled 4-piston Nissin calipers on 310 mm floating discs up front and a single Brembo caliper and 310 mm disc at the rear give sensitive, yet powerful, braking under all conditions. 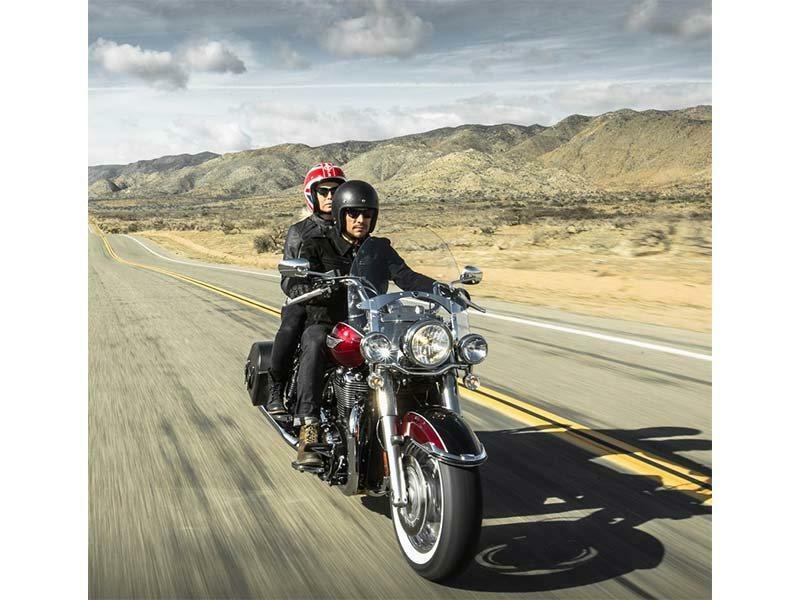 Handling:	The Thunderbird LT remains true to our core value of outstanding handling in all situations. As the result of careful development work on its steering geometry, the LT is no exception and delivers light, neutral steering, low speed agility, yet maintains stability at all speeds and in all types of conditions. Combined with a great degree of manageability, it’s an easy bike to ride for any rider. Wheels and Tires: Our engineers turned to British tire manufacturer Avon with whom we jointly developed the World’s first and only whitewall radial for the dramatic look of fat-section 150/80 16 in. front and 180/70 16 in. rear tires on wire 56-spoked rims. Frame: A dynamic engine with dynamic styling demands an equally dynamic chassis; one which reflects our belief that every bike, whatever its style, should be agile yet stable, have predictable, neutral steering and superior suspension and brakes. 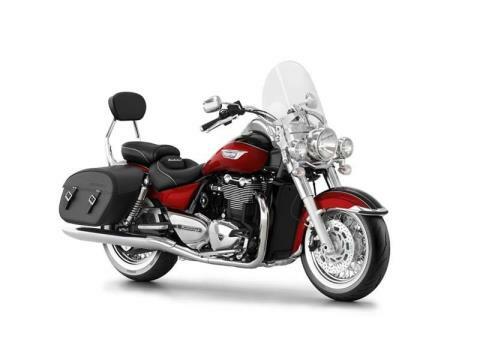 The Thunderbird LT is no exception to that rule. Footboards: The high quality rider and pillion footboards are made from chrome-plated, high-pressure die cast aluminum, featuring replaceable skid plates and an adjustable heel / toe gear lever for the rider. ABS: Triumph’s anti-lock brake system comes as standard and the ABS-assisted brakes ensure stopping is quick and efficient. Seat:	Rider and pillion seat foam is a double-layer, dual-density material, soft and receptive on first feel but compressing to give a firmer, supportive yet pliant ride. The rider’s seat has also been especially shaped with wide, flared sides and a lumbar support to provide maximum comfort even at the end of a long day’s ride. The cover material contains a degree of elasticity so that it ‘gives’ as the seat compresses, maintaining the ideal shape and reducing uncomfortable pressure points. Overview:	The motive force at the heart of the new Thunderbird LT is the world’s largest parallel-twin motorcycle engine, as found in the existing Thunderbird Storm and based on the original Thunderbird. Configuration: Whether crossing continents or on a Sunday morning run, the LT’s awesome engine potential is harnessed by a progressive throttle, highly accurate fuel mapping, cutting-edge sequential fuel injectors, a positive 6-speed gearbox. The result, from the top end of first gear to the bottom end of top gear, is an unrivaled ride in this class. Performance: At 1,699 cc, the LT’s 8-valve DOHC motor produces a whopping of torque. The enormous thrust from its pair of saucer-sized forged pistons and uneven, long-stroke 270-degree firing interval create a classic big-twin feel, perfect for propelling the you over long distances with a natural, easy-going groove. Belt Drive: The Thunderbird LT has a belt drive for low maintenance and long life. Sound: To match the quality of its ride, the LT’s tapered tri-oval exhaust cans aren’t just built to look good, they’re especially tuned to give a rewarding, rich sound. Chassis: You get a pair of removable leather saddlebags, auxiliary spot lamps and the world’s first white-walled radial tires riding on wide, wire-spoked rims on the new LT. The ergonomics feature a completely redesigned, reshaped seat, with deeper foam padding and lumbar support for maximum comfort, while maintaining a low seat height to accommodate all sizes of riders. Engine: Striking machined fins pick out the distinctive parallel-twin shape, while chrome engine covers are offset against jet-black barrels and crankcases. A pair of wide, dramatically splayed exhaust pipes dominate the LT’s front three-quarter profile with their classic ‘header-run’ following a straight line from the throttle bodies through to the headers. Our parallel-twin heritage for all to see and admire.